Are you looking for your first road bike and want to know enough to avoid wasting your money and buying a dud? There is a lot to understand when it comes to beginner road bikes, no matter what your intended use, be it a simple ride around town, commuting to and from work, races, triathlons or just looking to improve your fitness. In this guide, you will find everything you need to know if you are just getting started as a road cyclist. What Makes Road Bikes Different? The classification of “road bike” is one among many, including hybrid bikes, mountain bikes, and others. But what makes a road bike so different from other choices on the market? 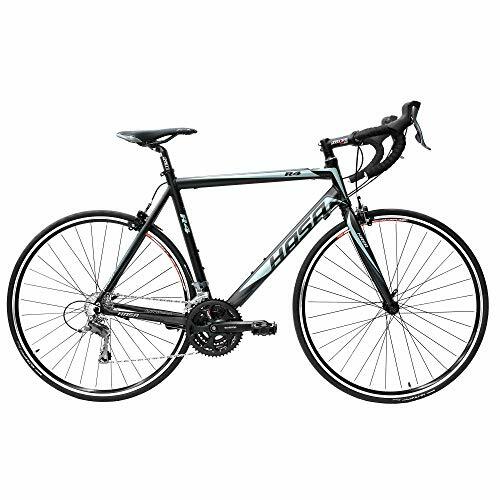 Road bikes are designed for riding on flat surfaces like the road or sidewalk. This means that if you plan to use it to ride around town or train for a bike marathon, a road bike is definitely what you need. The design and weight of the frame are a key difference between road bikes and others. The frames are often much lighter and designed for speed, for effortless riding across payment. This is the reason road bikes are the choice of bike racers. Within the category of road bikes, you will also find that there are two main types of handlebars. Road bikes usually have either drop-bar or flat-bar handlebars, which will make a difference in the type of ride that you will have. Drop-bar handlebars are designed for riders that expect the most out of the speed of their road bike. They require the rider to bend forward as they ride, into a bent position. This position optimizes efficiency and speed. The position that you must ride in makes drop-bar handlebars a bad option for anyone with back problems or limited flexibility, however. The other option is a flat-bar handlebar, which gives you the option of sitting in an upright position as you ride. Not only does this reduce strain on your back, but it also reduces the strain on your shoulders, wrists, and hands, as well as increasing your visibility. These can be a great option for some individuals, though it is important to note that they are not quite as efficient as drop-bar handlebars. The important thing to remember when you are looking at bike components is that you will usually get what you pay for. While that does not mean you will not be able to find a bike in your price range, it does mean that you should expect to get more usage out of a higher end bike before you need to replace parts. If you do choose a bike with lower quality parts, however, remember that you can always replace them as you get more money to invest in your bike. It is important to note that most road bike manufacturers cut the total cost of their bike by choosing certain lesser-quality components. This often includes the wheels, tires, bike seat, and pedals. Luckily, these are relatively cheap to replace and you can choose your own higher quality components after you have purchased the bike. One of the first things that you need to take into consideration before choosing a bike is bike sizing. Many road bikes are offered in small, medium, or large. While the small, medium and large sizes will differ between bike companies (and even specific models), you can easily determine which is best for you by taking into account the length of your inseam, as well as the reach of your arms. Bikes are often sold proportionate, so companies assume those with longer legs also have longer arms. When it comes to sizing, your overall height should determine whether you need a small, medium, or large bike. Instead of paying attention to the sizes, however, you should use the measurement of the bike in relation to your size to pick the right bike. Then, after you have purchased the road bike, you can take it to your local shop to get the perfect adjustments. Here is a handy chart that you can use to determine the optimal road bike size for you. After you have purchased a new bike, it will go through what is known as a “break-in” period. The duration of this period really depends on the miles you put on your bike. If you have tightened, lubed, and adjusted each of the parts of your bike, then there will only be a few notable differences. As you ride your new bike, the cables will begin to stretch and wear which will make the bikes shift more smoothly. You may also notice a smoothness in the operation of the brakes. Even though your bike must go through this initial break-in period, it is important to get a tune-up after about a month. This tune-up is best done by a professional if you are a novice road biker, but you can do it yourself if you are comfortable. The tune-up should include re-tightening and readjust the bike if it needs it, and lube up some of the parts. Whether you want to start off with a beginner road bike under $200 or you are looking to spend up to $1,000 on your bike, this section will tell you the best bikes in your price range. One of the best choices would be the 21-Speed 700C Aluminum Road Bike by Merax. This bike features high-quality Shimano derailleurs and shifters and an aluminum frame that is both lightweight and durable. There are several great things about this bike. First, it offers a really smooth ride. It brakes and changes gears very easily. The bike itself is very well put together, which allows it to offer an effortless ride. The 21-Speed Aluminum Bike by Merax is also easy to assemble. As an added bonus, it is available in two different color options (green and red). 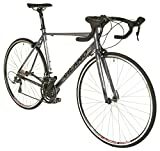 Men’s Volare 1200 700c Road Bike by Schwinn is one of the best purchases you can make within this price range. Some of the key features of this bike include 700c wheels, an aluminum frame with a fork designed for fitness, 21 speeds, and alloy parts. The shifters and rear derailleur are made by Shimano and the bike also feature an alloy crank, alloy wheels, and alloy linear pull brakes. There are several advantages to this bike. Its lightweight frame and high-profile wheels allow it to offer a smooth, effortless ride. It is a great option for commuting to and from work or the grocery store or just riding for fitness. The other great thing about this bike is that its gears and brakes operate flawlessly. For a mid-priced road bike, you will be spending about $500. If this sounds like you, then the R4 Road Bike with 21 Speed and Shimano Parts by Hasa may be a good choice. The features of this bike include high-quality Shimano derailleurs and shifters, an aluminum alloy frame, and CNC machine walled wheels. The frame of this bike is extremely lightweight but still durable. The company guarantees the frame so much that it comes with a lifetime warranty. Another advantage of this bike is almost every part is made of aluminum alloy. This results in a bike that is extremely lightweight and top of its class. In addition to all of the great mechanical features of this bike, it comes with a sleek, smooth design. You can tell that HASA is a company confident in what they are selling. In addition to the lifetime warranty on the frame, all of the parts are guaranteed for a year, excluding the tires, tubes, and brake pads. If you want to spend a little more to make sure you are getting a high-quality bike but are not quite ready to drop as much as $1,000 on a bike, then a good option for you is the FORZA 2.0 Aluminum Carbon Road Bike by Vilano. When you spend as much as $700 on a bike, you expect it to be of high-quality. The Vilano company does not disappoint with this model. The frame is made of aluminum while the fork is constructed of carbon fiber, which makes it one of the lighter bikes on this list. It also features Shimano Tiagara shifters and Shimano derailleurs, so you know that you are getting mechanical parts. The tires of this bike are double-walled 700c models. The frame, paired with the amazing tires, means that you can easily reach high speeds with little effort. Finally, the bike is extremely easy to assemble which is good news if you are not familiar with your local bike shop yet. Even if you plan on spending up to $1,000 on a bike, you need to be sure that it is high-quality. The best road bike under $1,000 is the Century 2 Road Bike by Diamondback Bicycles. This bike comes with high-quality parts all around. It features a 7005 aluminum frame (while many others come with 6061 aluminum) and a carbon fiber fork, both of which are lightweight and extremely durable. The shape of the frame is also great, as it allows you to sit forward enough to get the speed you would expect from a road bike without the strain that you may have on your neck and back. It also features dual-control shifters by Shimano that shift flawlessly between gears. This bike also comes with wider wheels, meaning you can take gravel roads and pebble paths without a problem. The Century 2 provides a comfortable, effortless ride- whether you are riding to work or training for a triathlon. 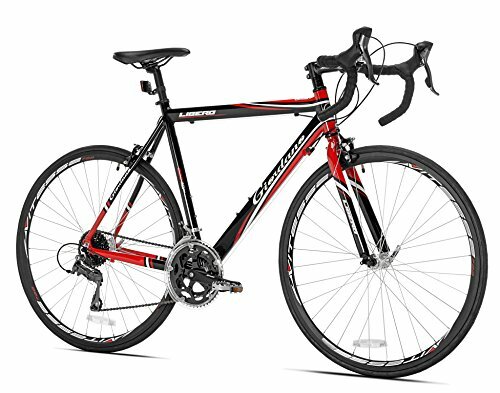 The first bike on our list of the best beginner road bikes is the Men’s Volare Bike by Schwinn. This bike is marked exclusively to men, however, its features allow it to be a great option for women as well. It comes in gray, a gender-neutral color, and it is offered in several sizes. 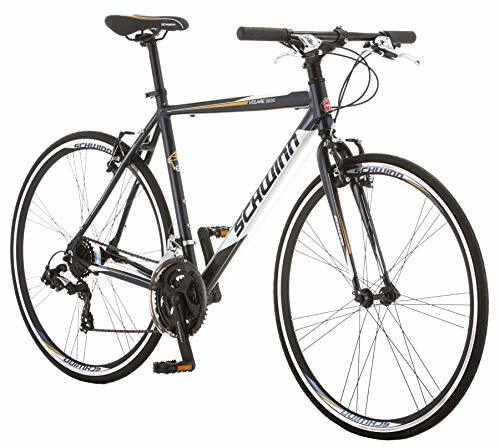 The Volare Bike by Schwinn has several advantages, with the first being its affordable price. This bike can, but this starter road bike does not sacrifice quality because of this reason. It is extremely lightweight compared to other bikes in its price range, weighing just 29 pounds. This means that it is even a great choice if you are planning on participating in a triathlon. 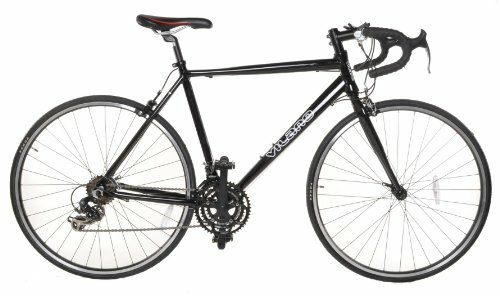 While you may need help if you have never assembled a road bike before, the Volare Bike is very easy to assemble. Another advantage of this great bike is that the gears work very well, meaning it shifts quickly and easily. While this bike does not sacrifice quality for the low price you are paying, there are a few things to take into consideration before you decide it is the right beginner road bike for you. First, this bike is only offered in a single size. While it is adjustable, it will most likely be uncomfortable for people over six feet even with adjustments. Additionally, newcomers to the biking sport may have difficulty with assembly, particularly because the bike does not come with instructions. Though it is a bit of an inconvenience, however, it can easily be assembled with the help of YouTube videos or your local bicycle shop. The Libero 1.6 Road Bike by Giordano has a cost that is a bit more expensive than some of the other beginner road bikes, but it is a good beginner road bike nonetheless. This bike features water bottle mounts, something not found on any of the other bikes on this list of good starter road bikes. This makes it ideal for long rides, whether you are planning to use the bike for long fitness rides, marathons, or a long commute to work. Another advantage of this bike is that the adjustable seat allows it to adapt to the right for riders between 5’1” and 6’5”. The tires of this bike are very high quality, the brakes are simple to use, and the gears shift very easily. There are only a few disadvantages to this bike, but none that are deal breakers even with the higher price. The first disadvantage to consider is the crankshaft, which is not of the highest quality. While crankshafts are relatively cheap to replace, it is disappointing that they may become easily unthreaded after paying a pretty hefty price. Additionally, this bike does not come with instructions, but you can watch videos or have a bike shop assemble them if you are not comfortable doing it yourself. Another disadvantage of this bike is that it shifts to just 15 speeds, which is less than any of the other bikes on the list. Finally, while the tires are great, the inner tubes are not of the highest quality and they may need to be replaced after a short time. Next on the list of road bikes for beginners is Vilano’s FORZA 4.0 Road Bike. The FORZA 4.0 Aluminum Road Bike by Vilano has several great features, which you would expect for the cost. Whether you plan to ride recreationally, bike to and from work, or train for a marathon. The biggest advantage to this bike is its gears. The FORZA 4.0 features 24 speeds, while the next highest amount on the list is 21. Even with the extra speeds, the gears transition very smoothly because of their high-quality integrated shifters. The bike also features a drop bar, meaning you can choose to ride with the handlebar up or down, so it is tailored to your level of comfort. In either position, the gears shift seamlessly. The other hardware parts are also as impressive as the gears, being very durable and of high quality. Another advantage of this bike is that it offers a very easy assembly, even if you have never assembled a bike before. Finally, the different size options that are offered make ideal for riders large and small. The FORZA 4.0 by Vilano is slightly more expensive than some of the others on the list. This is probably because of the high-quality shifters and hardware of the bike. Even with the high price, however, there are a couple of disadvantages that must be considered before your price. First, some people may find that the seat is uncomfortable because of the very thin padding. This can easily be replaced, but you would expect more for the high cost of the bike. Additionally, the pedals, tires, and inner tubes are of lower quality. The pedals are free with a purchase of this starter road bike, so you can’t really blame the company for the cheaper parts. However, the low-quality tires and inner tubes are quite a disappointment. They are relatively cheap to replace but you would definitely expect more after paying so much for this bike in comparison to others in the same class. 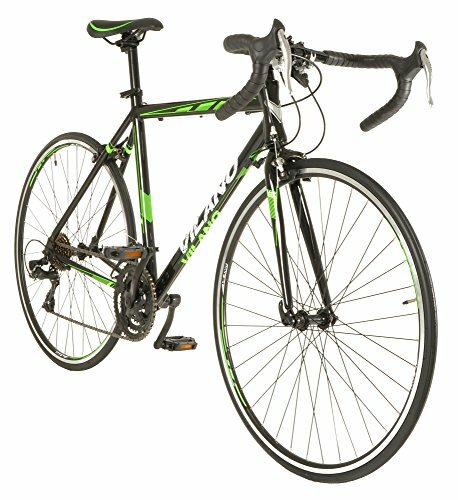 If you are looking for a good starter road bike at an affordable price, this bike is a great option. 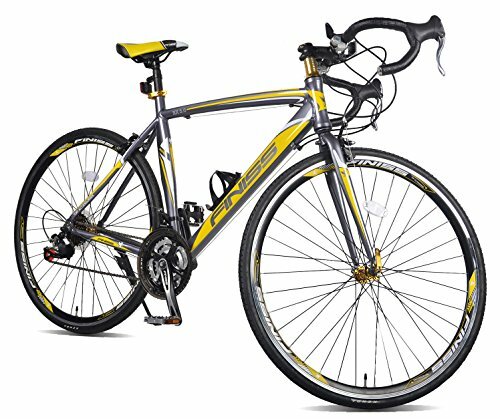 The 21-Speed 700C Aluminum Road Bike by Merax has several advantages, with the most notable being its price. This is the most affordable bike on this list of best road bikes for beginners. With the high-quality functioning and hardware of this bike, the low cost is an incredible deal. The frame of this bike is both lightweight and durable, making it a great option for any type of riding. Its high-quality features and 21 different speeds allow it to be ridden in any environment- whether you want to bike on a trail or ride it on the streets to commute to work. Additionally, the gears are extremely easy to shift, meaning that you can easily transition from flat to hilly terrain. At such a low cost, you would expect there to be a lot of downsides with the 21-Speed Road Bike by Merax. However, there are only three. First, the bike comes mostly assembled from the factory. This means you can assemble it yourself, but some have quite a bit of difficulty connecting the seat to the bike. This is due to the shape of the connectors. It takes a bit of force, making it quite difficult to adjust. The second downside of this road bike for beginners is that the height is a little bit on the shorter side. Even the tallest frame offered for this style of bike is not comfortable for someone over 6’3”. Finally, this bike does not come with a kickstand. This is a minor drawback, as you can easily purchase and attach one yourself. The last on our list of good starter road bikes is the 21-Speed Aluminum Road Bike by Vilano. One of the best road bikes for beginners. There are several advantages to this bike. First, it is extremely lightweight because of its aluminum frame. This is made durable, however, by its double-butted joints. The durable yet lightweight frame makes it great for road biking regardless of the reason you are choosing to ride. Another advantage is that this bike is on the cheaper side. While it is not the cheapest on our list of road bikes for beginners, this can be expected because of the high quality offered by the company. Another advantage of Vilano’s 21-Speed Aluminum Road Bike is that it is very easy to assemble. It can be done even by individuals with very little experience, though you always have the option of going to a bike shop if you are uncomfortably assembling it yourself. Finally, for the most part, this bike is made of high-quality hardware. The shifting and braking systems both work very easily. As with any starter road bike, you can expect that the lower price will come with a few disadvantages. The first downside is that this bike comes with very cheap pedals. In the company’s defense, the pedals that come with the bike are free, as pedals are not included. Pedals are also relatively cheap to purchase and easy to install. Additionally, while the actual tires on this bike are of a higher quality, the inner tubes are not so durable. They may pop if you ride over rough terrain or potholes. Fortunately, bike inner tubes are relatively cheap to replace. Another disadvantage is the gears of the bike. While they are of decent quality, they do not shift quite as easily as some of the other bikes mentioned in our list of best entry-level road bikes. Finally, while most of the hardware found on the 21-Speed Aluminum Road Bike by Vilano is of high quality, the crank arm comes loose easily. It can be tightened but the poor installation means that you will probably need to replace it early in your bike’s life. Road bicycles, also known as racing bicycles, are designed and built for speed. A road bike prides itself in its efficiency, as its form and build allow it to move at faster speeds. This is in part due to its lightweight and the power at which a rider can pedal due to a derailleur gear system, drop handlebars, and a forward-leaning riding position. Usually, a road bike will also have wheels that are close together. In short, this kind of bike puts a priority on speed and aerodynamics, not on comfort. No one buys a bicycle with the intention of replacing it within a few months. That is why it’s important to properly care for and maintain a road bicycle so that it doesn’t suffer too much from wear and tear. Here’s how to do that. Gently rinse, wash, and apply lubricant to your bike regularly. You’d be surprised how much it lengthens its lifespan and generally makes your bike look great. If your bike is muddy or dirty after a tedious ride, don’t just put it away – clean it immediately. You don’t have to be super meticulous about it, but make sure it is clean. You should rinse your bike all over first to get rid of excess debris. Then, prop the bike up and wash your bike with warm soapy water using a sponge, switching to a brush to get too stubborn stains. Dry off the bike with cloth, then spray the wheels and bike with a degreaser. You can wax or polish after, but don’t overdo it or it will become sticky. Just apply wax every three or four washes. And there you have it: a clean bike. Regularly check your bike’s frame for rust or wear and tear. To do this, remove the wheels and look it over continually. If all is well, refer to the previous instructions on “washing”. You should look over your handlebars and make sure that the bolts are not loose at least once a month. If you have squeaky handlebars, loosen the bolts or caps of the stem and remove the bar. Wipe with cycle oil and reattach. If the tape around your handlebars is loosening or appears to be falling apart, you can easily replace it if you have the same kind of tape with you. Remove the plug and cut away the old tape, clean the bar to remove remaining glue, and then wrap the tape back on. Always wrap towards the saddle on the flat section, and in the direction that your hands roll on drops. A saddle can easily wear out over time. You can use shoe polish on yours if you have one made from genuine leather, as long as you remember to buffer it before riding once more. This will help a saddle to withstand harsh weather. Remember, you should always wrap your saddle in plastic when you aren’t using it. As for the post, clean and grease it with the rest of your bike, regularly. Double check to ensure there is no rusting occurring around the collar of the post. If it seems to show signs of rust, then replacing it is affordable and it’s best done sooner than later. Extra tip! Having trouble keeping the seat at the right height? Mark the post with a permanent marker or some masking tape. Oil the cable guide for the bottom bracket at least once a week, and immediately after a rainy ride, or else it may become stuck or gunky. If you are having issues with noise, then drip some oil into the derailleur pulley wheel hubs while you are at it. It’s important to make sure that your chain is the right length. Use a chain checker to do so; 24 chain links can reach 12.2” river to river at max. After that, the chain has to be replaced. In addition, a chain that skips almost constantly is bad news. In order to fix this, turn the derailleur’s barrel adjusted by half – to the right if the chain drops to a smaller cog and to the left if it goes the other way. Do try not to tighten it too much, though! You also need to oil your chain regularly. Lubricate between the side plates and under the center roller, though, not the entire chain as this will cause a greasy mess. Allow the chain to soak for several minutes after you have oiled it before wiping it down. Apply more lubricant when you next hear the chain squeak; till then, just wipe it clean after each ride. You should regularly measure the thickness of your brake’s disc pads. Note that they should not drop thinner than 2.5mm – if they do, they need replacing! As for brake cables, when you cut them, put a cap over them for the safety of your hands and skin. First, understand tire pressure. Under-inflated tires will cause flats and make you expend more energy, but over-inflating will cause them to burst more easily if they take damage. Use a pressure gauge to ensure that you are doing okay, regularly making sure it doesn’t get too low and using it to make sure you don’t put in too much. You can check the maximum compression printed on the tire if needed. In addition, if your tires are tubeless, it’s worth noting that the sealant on them will dry out. As such, you will need to remove and reapply that sealant once every couple of months. You should also be sure to check that your bike’s tire’s treads have not worn too thin to the point where they begin to disappear. Summer tires and other tires without treads will flatten as they wear out. Lastly, considering purchasing and attaching front and rear mudguards to your tires so you don’t have to deal with splashes in wet weather! 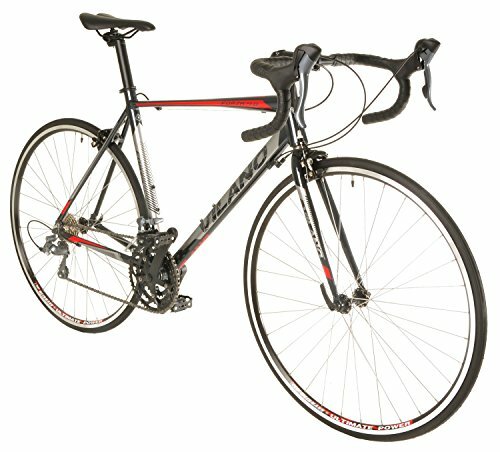 What kind of riding can I use a road bike for? There are very few tasks that road bikes cannot perform, and there are many things you can use one for. Of course, many road bikes are designed specifically for racing, but you can also use them for an urban commute. What are road bike frames made from? Road bike frames are made from either aluminum, steel, or carbon fiber. Aluminum is the most common material for road bike frames due to its lightweight yet strong nature. It’s comfortable to use but it also highly reliable and can perform well. Steel, meanwhile, is also a relatively popular material, and they are durable and comfortable. Carbon fiber sticks out as a material, as it is usually only used in higher end bikes. It is extremely stiff but also very lightweight, and the fact that it does not originally come in tubes means that it can essentially be shaped in any way. This means that these bikes can be made to be very aerodynamic, providing a big performance advantage. Should I get a disk brake road bike or a traditional caliper brake road bike? It depends on what you are after. Disc brakes have excellent, consistent stopping power in any and all conditions, even in dirt, mud, or puddles. On the other hand, traditional rim brakes are very easy to maintain and are much cheaper, and are therefore more popular in the market. 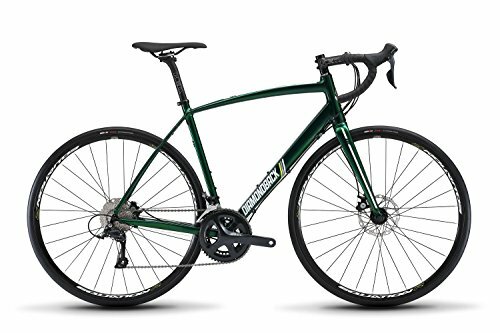 How do I choose the right bike size for me? This is a very important step. Don’t compromise in this area at all; don’t buy a bike that’s too big or small because it’s more affordable. Go to your height and dimensions and find a bike that fits you best. If you are ordering online, then it’s good to know that road bike sizes are usually presented in centimeters. But different manufacturers may measure their frames in different ways, which can be quite confusing, especially since every potential rider has a body shape unique to them. Have a look at the size chart and study it carefully. If you are ordering from a store, test out the bike. Put your leg over it and see how easily you can get on, and take it for a test drive if you can. You should be able to stand of the frame with some space between the top tube and you. 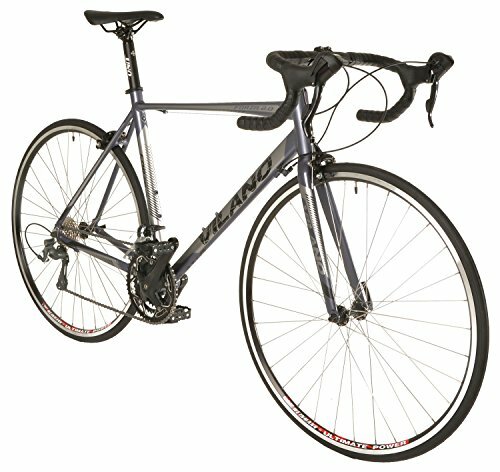 How can I find a good bike fit, and why is this important? Bike fitting services are available in many bike shops. A bike that fits you well should have its saddle, handlebars, and stem at the right height and position for you to feel natural while riding. This is especially important if you are switching from a mountain bike to a road bike, as road bikes cause you to spend a lot of time leaning forward in one fixed position. Therefore, comfort is important and a bike has to fit you correctly to avoid injury. As a sport, bicycle racing has existed since the 19th century, making use of high-wheeled bicycles that made the exercise quite hazardous due to hard tires and barely-there brakes. The bikes prioritized speed, forcing them to create larger and larger front wheels of up to 60” wide, which only meant more crashes. In order to compensate, manufacturers began to even out the wheels and make both the front and back the same size. The pneumatic tire came around soon after, leading to bikes adopting them for races in 1889. This meant better safety and led to bicycle racing becoming a much more famous sport. It became popular in the United States in velodromes, and track racing also grew in Europe. Long distance road racing also picked up in Europe, and in 1903, the Tour de France began. But pre-war era bikes had much more flexible frames, which often made them more difficult to maneuver, although their long wheelbase made up for it with added stability. Their tubing was lightweight and butted, and wheels were made from wood. It wasn’t until 1937 that aluminum rims became a standard for road bikes. It is also worth noting that derailleurs were also not implemented until then despite having been conceived decades earlier, as they were considered unreliable and the cause of unnecessary drag. At the time, multiple gear ratios were used instead with three gear cogs upon a rear freewheel. This made gear changing a long and tedious process. Only in the 1960s did manufacturers begin to create the road bikes we know today – the ones with the dropped handlebars, light frame, multiple speed options, and narrow, closely spaced tires. Modifications were made with new technology in order to achieve perfect speed and the best aerodynamic structure, leading to today’s modern road bike.